The S2 mixer at Hospital Radio Wey. Hospital Radio Wey the volunteer radio station based in Chertsey began at Weybridge Hospital in 1965. It has expanded to cover Ashford and St. Peters Hospitals and is looking to increase its services to other hospitals, care homes and the health sector across the area. The hospitals are each linked by BT landlines, and broadcast from 9am until 10pm each day, including live commentary from local football matches and other outside events of local interest. In 1989 the station moved to larger accommodation at St Peter's Hospital where it benefited from two studios. Here it expanded its facilities by introducing a digital playout system and an internet radio connection making it also possible to extend its service to care homes. In 2005, major decisions were made about the station's future due to some of the equipment giving service problems. A scheme to provide better studio accommodation could not be funded so it was decided to refit the existing studios. Peter Harman, Presenter & Studio Development Officer, said: "The choice of mixer was a key decision as this was the biggest investment for the two studios. Sonifex products were chosen because the S2 desks had a simple layout, standard XLR input connections and the company also had complementary studio switching and ancillary equipment. Since installation, our members have adjusted very easily to using the Sonifex desks and have commented favourably on their ease of use." Three mic/line channels were used and advantage was made of the dual inputs. One of the mic inputs was dedicated to the presenter's mic, the other two being guest mic's and a line input was taken from the permanently wired feed from the hospital chapel. Another mono line input mono was occasionally used when they had live music in the studio. There were two telco channels and one mix minus channel connected to three phone lines using a dual Sonifex HY-03 telephone hybrid and a single Sonifex HY-02 hybrid. One little bespoke change that was made to the second studio was to mount indicators in the hood in line with the channel strips to mimic the line-hold indicator on the HY-03, acting as a very effective silent incoming call indicator. Two SL1200 turntables were connected to two gram/line channels with the line inputs wired to phono sockets for use by external equipment such as laptops, tape machines and ipods. Finally, eight dual stereo channels were used as inputs for four Myriad playouts, two Denon DN-C635 CD players, a Tascam MD350 mini-disk player and a Tascam combined cassette and CD-RW recorder. There is also a feed from the respective other studio, a newsfeed and tuner output, to provide an off-air feed, available on desk inputs. The audio output is used to provide feeds for recording and headphone amplifiers via a ProAVM DA-IT distribution amp. Headphone amplifiers enable either station output (for guests) or presenters headphones with pre-fade (for trainees) to be available. 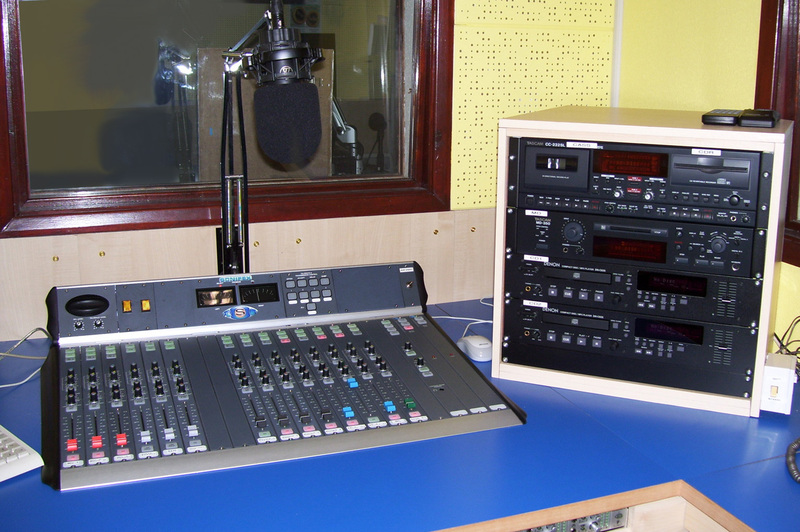 The main station transmission equipment was also replaced with the second studio using a Sonifex Station Master and appropriate Sonifex Redbox audio interfaces for distribution and studio indicator "On-Air" and "Mic-On" switching. 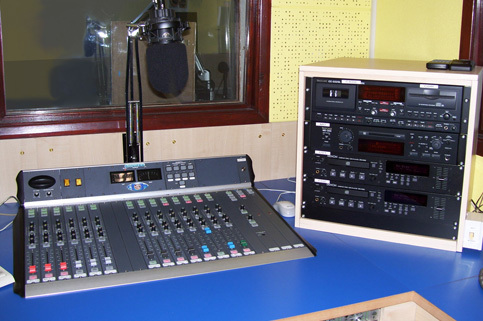 The new studios have served as a springboard resulting in a successful RSL FM broadcast in 2008. This has given valuable experience to the team of presenters as Radio Wey awaits the decision from Ofcom regarding a Community Radio licence application. The Sonifex S2 is a new breed of radio broadcast mixer. Using the latest technology components, it offers digital audio quality with analogue reliability in a modular format. The S2 has a wide range of input and output channels, PFL/cue, fader-start operation of equipment, automatic monitor muting on mic-live, light switching remote outputs, optional EQ on input modules, gram amp input options and 2 main audio buses, allowing you to broadcast on the PGM bus while recording on the AUD bus, with bus output selection on each module. It also has both digital and analogue input channels, together with simultaneous analogue and digital outputs.